The VIZIO E55-C2 may not be perfect, but this 55-inch HDTV is perfectly fine. VIZIO integrates full-array LED backlighting with local dimming into the displays of their larger E-Series 2015 line producing picture quality that should please all but the most demanding videophiles. And the designers have achieved that tricky balance of including the features and apps that will satisfy our inner nerd while keeping the user interface and remote control uncluttered, which helps us maintain our inner peace. VIZIO has also simplified its 2015 lineup of TVs. Now, the only Series of full HD TVs is the E. The M-Series, P-Series (and on-the-horizon high dynamic range Reference-Series) are all 4K Ultra HD class TVs. The VIZIO E55-C2's combination of lovely picture quality and popular features that are easy to use, all wrapped in a competitively priced package earns our Highly Recommended rating. With the advent of 4K displays, the galaxy of TVs has expanded and many of these new Ultra High Definition TVs have raised the bar on picture quality. Within the context of HDTVs, I would rate this E55-C2's full-array backlit (with local dimming) fueled video performance at 4.5. Audio performance is nothing to sing about, which is probably why VIZIO suggests pairing this E-Series TV with one of the company's sound bars. All the features that most of us need like integrated Wi-Fi and a wagon load of streaming content providers are included. What's not part of the package - and aren't really missed by me - are voice recognition, motion control, and 3D capabilty. Set up is a snap. The two Calibrated Picture Modes make picture adjustment easy. And the limited feature set makes navigation and operation much more manageable. VIZIO TVs have always been priced aggressively in this cutthroat marketplace. There always seems to be less expensive alternatives, but considering the video performance from the E-Series full array, local dimming display, the 55-inch E55-C2 is a very good value. 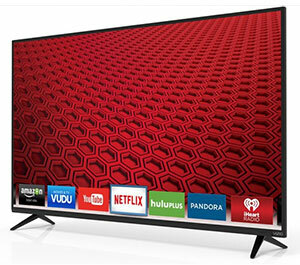 Right now, on their website, VIZIO lists this HDTV for $599. If you're vigilant, you may find it for less in the coming months.